How to turn a dark and dated dining room into a bright and inviting space ready for entertaining! Now that I’ve put the finishing touches on the dining room, I’m finally ready for the big reveal of the finished product! It’s a great feeling to be able to show you a completed room after chipping away at the space for months. I’m going to be a bit of a rebel again. 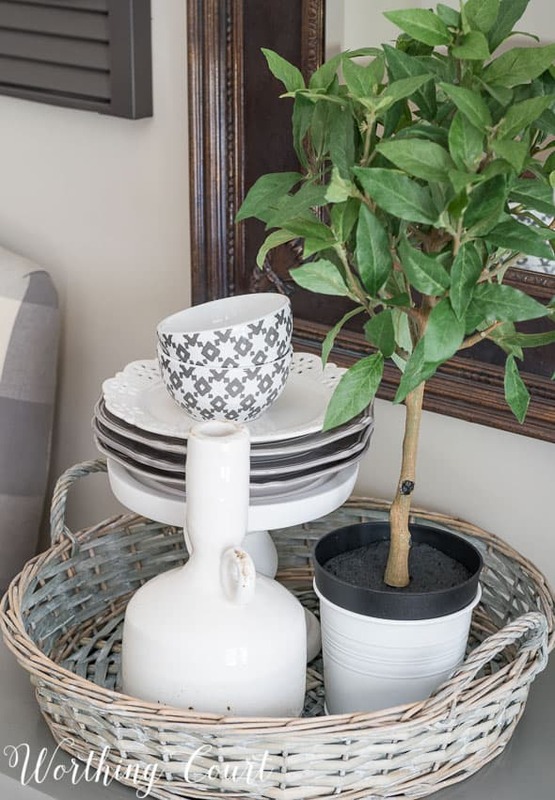 Just like when I shared the before and after reveal of my family room, I’m going against the “blogging rules” and showing you the not-so-great before’s first, instead of a beauty shot. 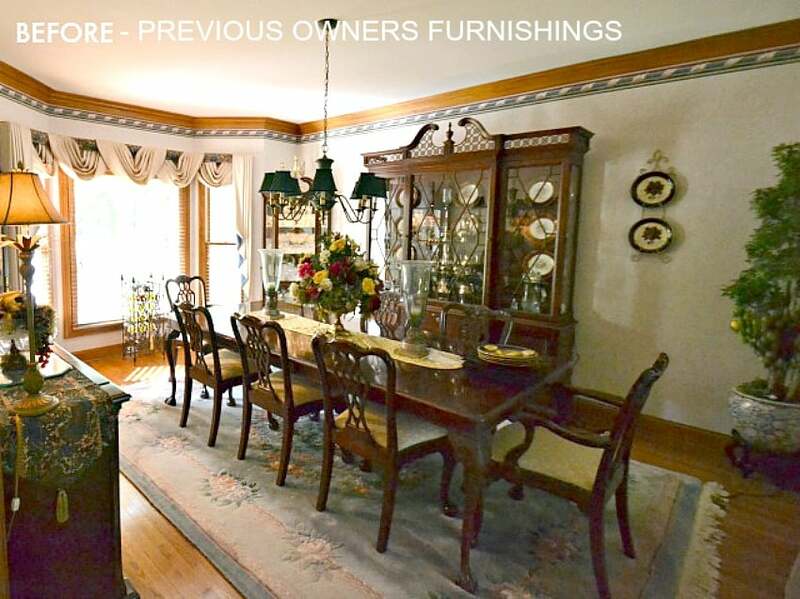 This is the dining room as it looked on the day that we first looked at the house. The owner had the room decorated in a very traditional style, with dark trim and heavy dark furniture. This shot is taken looking back toward the doorways to the kitchen and office. Good grief, it’s hard for me to even remember the room looking like this. And this is how the room looked before we started the makeover. At this point we had removed the wallpaper, repainted the trim and walls, replaced the chandelier and refinished the hardwood floors. This is how the room looked for about 18 months, while we finished up remodeling the kitchen, breakfast area, laundry room, screen porch and family room. And, here’s how the room looks today. So much brighter! We completely remodeled this house when we bought it, but this is one of the rooms that, thankfully, only needed cosmetic changes. The super fast and easy planked wall was one of the very first makeover projects that we tackled and boy, what a difference it makes in the room. 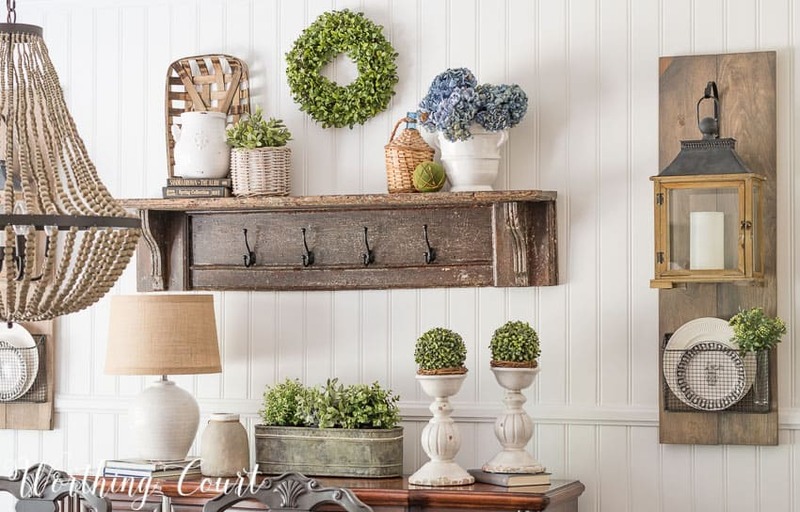 I’m calling it vertical shiplap and it says instant farmhouse to me! Click HERE to read all about how we created this planked wall in one afternoon. Maybe you remember my post about the diy Fixer Upper style hanging lanterns that I made for either side of the sideboard. Well, I knew that I would have fun changing up what is displayed in those baskets beneath the lanterns. I replaced what I originally had in the baskets with a couple of plates and just one vase with greenery. In case you missed it, click HERE to read the step by step tutorial. I’m still in love with the large wall of botanical art that I added to the wall beside the door going into the kitchen. I think that it adds a lot of life to the room and fits in well with any greenery that I have in here. You can read all about how I created all of the art for only $75 by clicking HERE. I decided to simplify the centerpiece on the table and replaced the large lantern and topiaries that were on it with my doughbowl filled with all sorts of summery goodies. We’ll take a closer look at that on another day. One of the more dramatic changes to the room took place on the wall opposite the sideboard. 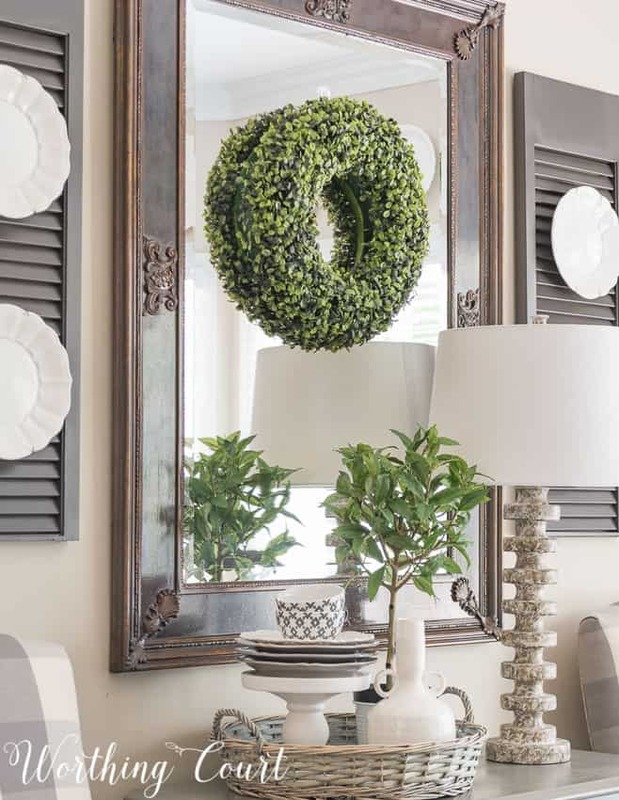 I had agonized so much about what to do with the little cherry chest that used to live under this mirror, but it finally occurred to me that my already-gray chest, that was in the foyer, would be perfect in here. And then – it was pretty much a no brainer when Pookie asked me what I wanted for my birthday…to recover our old office chairs! I used two euro shams from Ikea to make the lumbar pillows for each chair. I love their pattern mixed with the buffalo check. Because of the additional bit of light that it adds to this sometimes dark room, I decided to keep the mirror above the chest instead of replacing it with a chalkboard. The newly painted mirror blends wonderfully with the rest of the room now. Plus, I really like the way that it reflects the sideboard vignette on the other side of the room. And btw – I get asked about these shutters a lot. They actually aren’t shutters at all, but are two parts of an old pair of bi-fold doors that I cut down. They’re spray painted with Rustoleum’s Anodized Bronze and I attached two D ring hangers to back of each one to hang them on the wall. I was very afraid of doing two things when it came to the makeover of this room. One was whether or not I would be totally wasting my money and regret adding a rug to this room. I don’t believe I would love the final result nearly as much if I had opted not to take a chance! 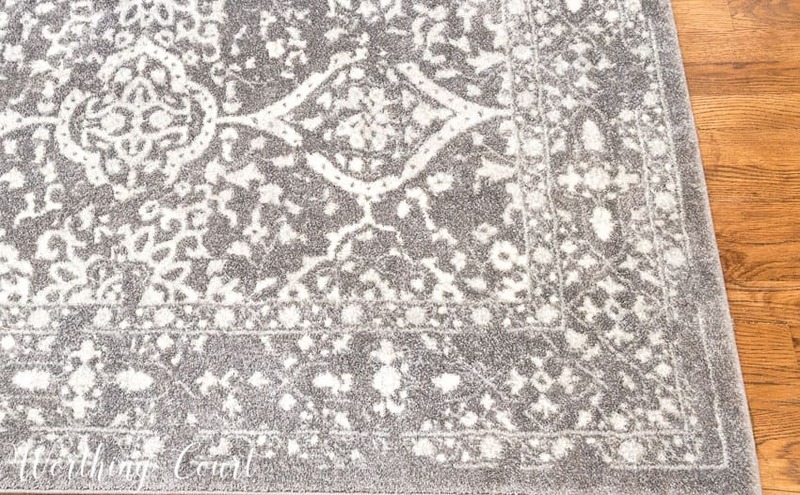 The rug is great quality and was a super deal for such a large one – under $300 for a 9′ x 12′. The rug has the slightly faded, worn vintage look that is so popular right now. It’s available in multiple sizes and can be found HERE. My second fear, and the biggest one of all, was whether or not to paint my table, chairs and sideboard. I mean, once it’s painted, it’s painted – right? My furniture wasn’t all that expensive when I purchased it back around 2004, but neither was it the least expensive I could have bought. I was so afraid of ruining it, but with encouragement from friends and family, I finally realized that it was the right thing to do for this makeover. I’m sooo happy that I took the plunge! Click HERE to take a closer look at all of the pieces that I painted and the various techniques that I used. So for those of you who are contemplating any sort of a makeover, my advice is this – TAKE YOUR TIME. If you’re unsure of anything, just complete one step at a time and you’re bound to be pleased with the end result. Beautiful room – you are so talented. You’re too sweet, Anne Marie. Thank you! Can you please tell me where you got the gray chairs in your dining room? I have looked everywhere. Love the gray with the fabric. Thanks. so much…..You’re home is beautiful. Hi Sherry. I purchased the chairs at a local furniture store several years ago. They were originally located in the office of my previous home, but I had them recovered for this house. I think they’re called Martha Washington Chairs if you want to do a Google search to look for some. Hi Diane. The walls are painted with Sherwin Williams Accessible Beige. Quite a transformation!! Thank you for showing the before photos from when you bought the house – it’s hard to believe it’s the same room. You didn’t mention them, but I love the plates on the shutters. I’m also fascinated by your color choices…the walls look so nice with your gray furniture. The room is very soft and soothing. I’m so glad that you like it, Jen. Thank you! When we painted the house, I wanted gray, but my husband wanted a shade of beige. Soooo, we tried out several samples until I ran across a shade of beige that has gray undertones in it. I’m happy to hear someone say that they like the wall color with gray! Hi Ronda. The walls are painted with Sherwin Williams Accessible Beige. The room faces the west, but it doesn’t get very much light because our house is surrounded by huge oak trees that block a lot of the sun. 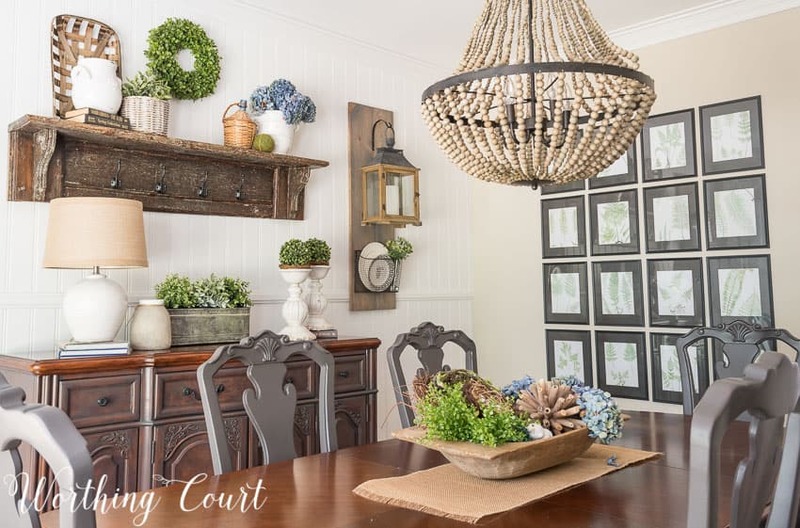 Your new dining room is beautiful Suzy! I love the buffalo check fabric that you chose. It doesn’t even look like the same room! So glad you like it, Pat. Thank you! I was shocked when I looked back at the pictures from when we looked at the house! It is a gorgeous room! I love your diy lantern sconces. Everything is so warm and inviting. I love that you painted your dining room table! It looks awesome and fabulous! So glad that you like it, Sherry! I was soooo nervous about painting the furniture, but now I’m sooo glad that I did! Your room is beautiful! I love it all! Thank you so much, Angelina! So very light and airy now. Love the fabric on the chairs. Thank you, Tammy. 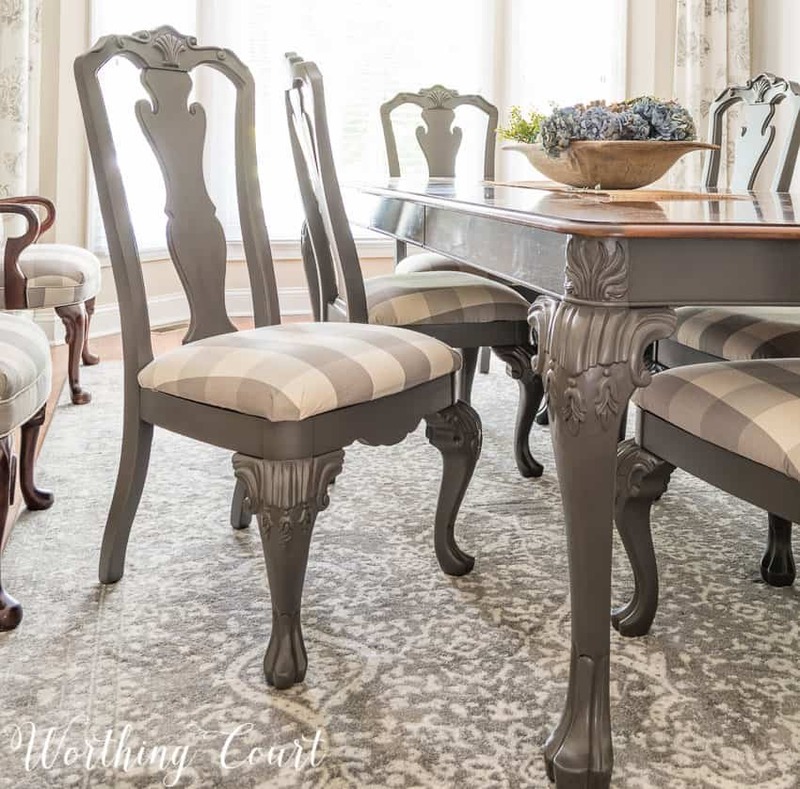 The fabric on the chairs is one of my favorite things in the room! Can you tell me what fabric you used, I love it! Hi Jeannie. Sadly, the store where I purchased the fabric doesn’t label their fabric with the name of the manufacturer or the pattern. 🙁 If you have a fabric store near you, maybe you could show them a picture from my blog and they might recognize it. I’ve done that before and was pleasantly surprised that the sales clerk knew exactly what it was. Sorry I can’t be of more help! Very nice renovation tips and your dining room look so beautiful and fresh after renovation. Artificial plants and garlands are looks so charming and eye-catching. So glad you like it, Lauren. Thank you! You’re transformation is unbelievable! I love all of the boxwood accents and how bright the space is! Thank you, Kate. I love boxwood and really struggle with not going overboard with it. I could use it everywhere! Wow! That’s quite a transformation! Your new dining room is gorgeous! I love your style!! Thanks for sharing. Thank you so much, Katie! What a beautiful transformation. 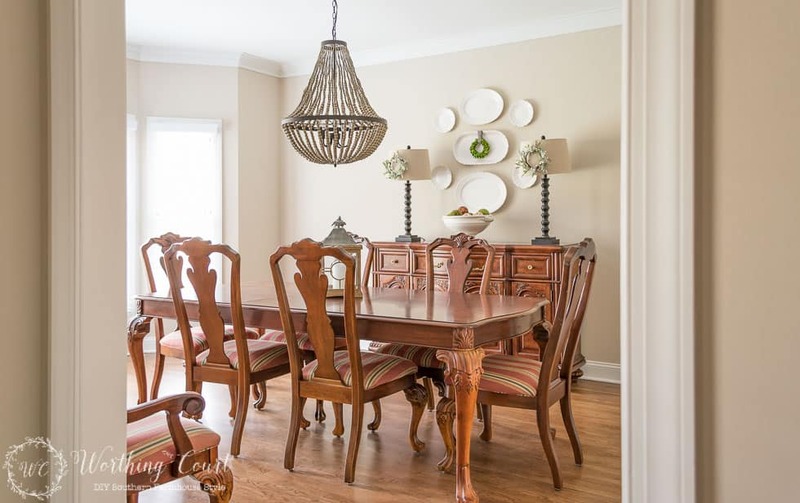 I love how your kept the same dining set and made it work with your new design. All the details are perfect. So glad that you like it – thank you! I love this room! I have all oak and would love to change it but I don’t know if I can take the plunge!! Meanwhile I’ll just envy yours? Oh, wow…it’s just beautiful! Especially enjoy this as we are changing our LR colors from blues to grays-thank you so much for sharing! I’m so glad you like it, Kym. Glad you found some inspiration! Oh my, that rooms was suffocating. I was so glad when I got to the after pictures and could breathe again!!! Looks amazing now!! Thanks for sharing at the Family Joy linkup! You’re right, Rachel. I never thought of it that way, but it was suffocating for sure. Thank you! 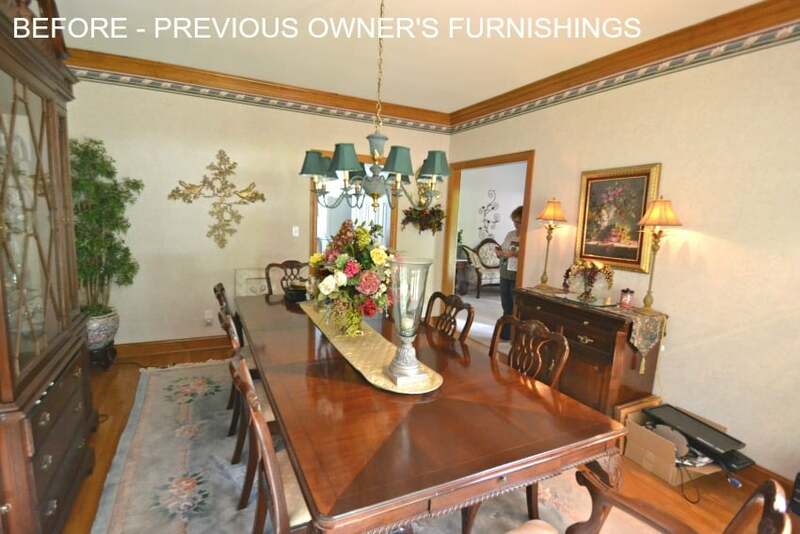 Your restyled dining room is lovely. It encourages me to try painting my dining room furniture. Thank you for sharing at Snickerdoodle Create, Bake, & Make! Thank you so much, Sharon! You did a beautiful job! I LOVE the transformation! Thanks so much for sharing with us at Share The Wealth Sunday! I love your planked walls and I adore how your painted furniture turned out! Thanks for sharing your beautiful project at Craft Frenzy Friday on Mom Home Guide! Oh goodness – thank you so much, Christine! Glad I was able to give you a little inspiration. Oh wow! Thank you so much Judy! You’re so sweet, Theresa. Thank you! Can I ask the brand and the color name of the paint you used on your walls? It is exactly what I am looking for! It is gorgeous in your home. Love this room now! You are so talented!!!! Hi Susan. We used Sherwin Williams Accessible Beige on all of the walls in our entire house. I’m so glad that you like the new dining room! I love everything about your dining room! I love the wall color! I was excited to read that they’re SW Accessible Beige in your home. I have been considering painting my entire home in that color as well. My swatch seems to appear gray in some lighting and beige in other areas – which might be a good thing! I’m still loving beige or the warmer grays. I am going to paint some larger sample boards and move them abut the house before committing. Does it look more beige or gray in your home? Hi Sue. All the things that you’re mentioning are the exact reason that we chose Accessible Beige. I wanted to paint the walls a light, but warm shade of gray – my husband wanted a beige of some kind. The Accessible Beige was the compromise because I think i’s a beige with gray undertones. So…to answer your question, it always appears more beige in my home, but it works really well with anything gray that’s in the room. Hope this helps! Yes, that is very helpful. Thank you very much! I love your home and your blog! Thanks for sharing with all of us so we can accomplish a beautiful home that we love too! Love the wall color would you please direct me to where I can find the paint colors in your home. Great job. Hi Susan. We used Sherwin Williams Accessible Beige throughout our entire house. Where did you find the buffalo fabric? Hi Charity. I found it a fabric store, located here in Greensboro, NC, called Printer’s Alley. Can you tell me where you purchased the candlesticks on the sideboard? I love chunky candlesticks! Hi Kathy. I love chunky candlesticks too! Mine came from a Pottery Barn Outlet. Not sure if they still sell them online or in their stores. Bravo! This room is absolutely gorgeous. 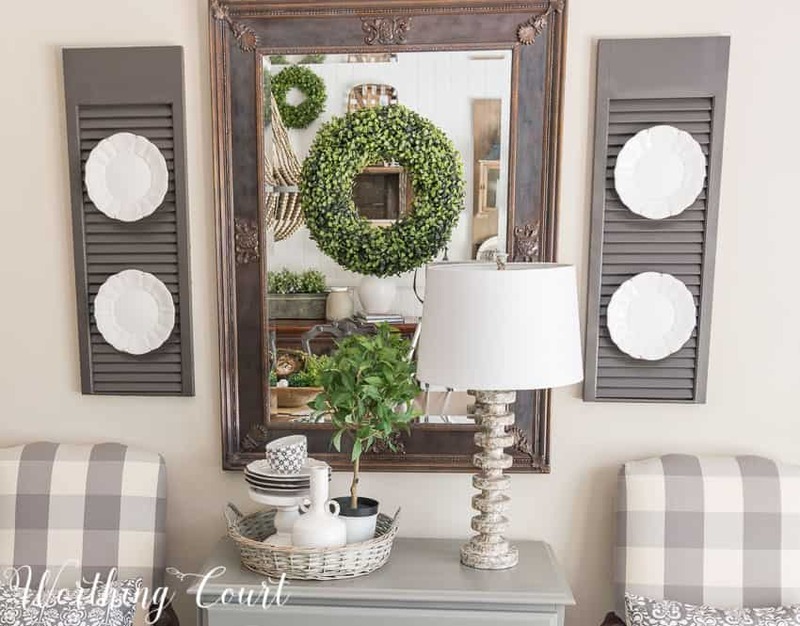 It will be very easy to transition through the seasons (can’t wait to see what you do at Christmas time in this room) and different styles of decor. Wow! It’s gorgeous! An amazing transformation. Love what you’ve done. Looks beautiful! Love your decorating ideas! Beautiful! I love that you have upcycled so many of your old pieces of furniture and that you shared all this wih us . Your dining room is just beautiful! We are recent empty nesters and have downsized. One of the things I gave up was a formal dining room. I do miss having all those surfaces to decorate, haha, but so far have not really missed having a formal dining. I can,t believe it,s the same room. You have an amazing talent for seeing what could be and the courage to tackle it. I love love love what you did with this room. My favorite picture/room here is the chest with the mirror and those chairs! Absolutely stunning. Have pinned that for copying!! You are so very, very talented and I so appreciate you sharing that talent with the rest of us. Wonderful ideas. Really loving those gray tones throughout. Amazing how that freshened up and brightened the entire room !!!! Thanks Suzy for your inspiration !!!! Suzy, once again I am amazed at your wonderful style. I love all the greenery and I just can’t wait to see what you do at Christmas. Oh and by the way I found the kuerig holder at wayfair. I am so excited. That’s awesome, June! If you have time, would you mind emailing me a link to the K cup holder you found? I get asked about mine all the time and would love to know where to send people to get one! My email is: worthingcourtblog@gmail.com. Thank you! What a refreshing change! Absolutely stunning!! It’s given me the courage to tackle updating my dining room set. Thanks so much for sharing your adventure. I love the way that you redid the dining room set. The grey is a wonderful color choice and looks so beautiful with the wood tones that you kept. Love your side chairs…I had 2 I gave to my daughtet…need to reclaim them! Wow! The room is really pretty with quiet charming details. I especially love the wall color and the fabric on the chairs! May I ask where you bought your curtains? Those are perfect for my dining room! Hi Nikki. I found those curtains at TJ Maxx over a year ago, but I saw two pairs at my local HomeGoods just last month. I love the chairs! I want to incorporate that same area in my living room! I love the little blue/gray cabinet under your mirror. I have an old dentists cabinet or typesetter cabinet that has a dark finish and well worrn. I would love to paint it. Are their any tutorials showing me how to paint it. I have never painted a piece of furniture. Thank you. Hi Chris. There are tons and tons of tutorials available for how to paint furniture. I’m sure you could just Goggle “how to paint furniture” to find some of them. In the case of my gray cabinet, I took the lazy way out and took it outside and painted it with spray paint. I did the same thing with my dining room chairs. Joanna Gaines has nothing on you! I love the transformation of the dining room. Just beautiful! Somehow I always come back to your dining room. It just can’t be beat in my opinion. Stunning chairs, well the whole room is stunning. I just come back and look at these pictures over and over! Beautiful Redesign! I especially love the fabric on all the seating! The mirror is also spectacular! Very elegant, yet comfortable! Like the DR transformation! Wondering how you attached the plates to the shutters? Love that idea! Thank you so much, Beth! To attach each plate to the shutters – I attached a plate hanger (the kind that has springs on the back and stretches to fit your plate and has clips for the top and bottom of the plate), then ran a long piece of floral wire from the top of the plate hanger (where you would hang in from a nail on your wall) through one of the slats on the shutter and twisted it a few times on the back of the shutter. I attached the plates to the shutters before I hung them on the wall. Hope this makes sense! So beautiful! I love your creativity! Just beautiful. I absolutely Love your style and what you do!! Love the plank wall! I am doing a complete Reno on a house about 50-60 yrs old. When we tore down drywall, we found beautiful 12″ wide ash planks! I’m leaving them as much as I can. 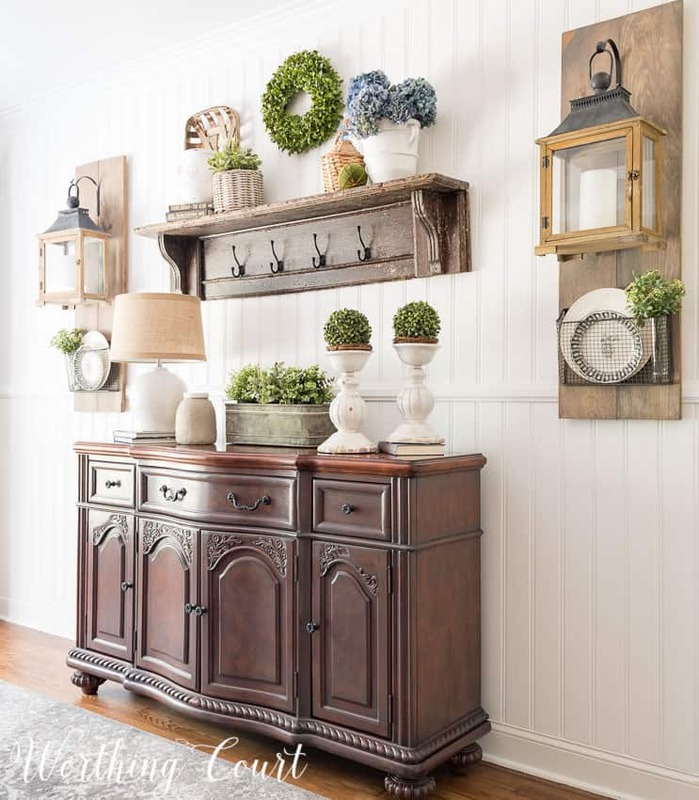 Love the look Fixxer Upper has!. Appreciate Chip and Joann Gaines work! Your dining room chairs are my favorite. Love the material and I have a similar chair that needs help. Love, Love, Love everything in this…Can you please tell me the measurements of the shutters with the plates on them…I so love it !!!!! Hi Bobbie. The shutters measure 34″ x 12″. In case you’re curious, the little salad plates are 8.5″ across. I love your Dining room! I hope you don’t mind I’m using it as inspiration for redecorating mind. Suzy, I have followed your decorating adventure from the beginning. I often wondered what you would do with the tables, chairs & chest because as pretty as they were they just didn’t fit the palette you had chosen. Your decision to paint them all was spot on. The room is absolutely beautiful and the quality of the furniture is enhanced with the gray base & wood top. Thank you for sharing your thought process behind your decisions. I’ve enjoyed it & learned so much. Suzy love your fall mantel. Looks so stylish. Also like your dining room make over. Great job! Absolutely love your fall dining room makeover! It’s gorgeous! My favorite…the boards with the lanterns and baskets underneath! Really enjoyed your blog this morning while drinking my coffee! Fantastic make over! Feeling very inspired. Love, love, love your style. New age country. I left my comments this morning but they were deleted. Suzy!!! YOU have inspired me to fix that dinning room set which has sentimental value but it’s in dire need of a makeover. We are moving to Tennessee next week and debated if we should even take it and I think this is the answer. Do you think I can get your two toned look with my cherry wood set? Thank you for sharing. Hi Vanessa. I absolutely think that the two-toned look would work with a cherry finish! In fact, one of my original plans was to paint the bottom of a cherry chest that I already owned – leaving the top cherry. The only reason that I didn’t was because I happened to already have the lighter gray chest that I wound up using in the dining room. Love the dining room. Love that you had the courage to paint it. It looks entirely different and beautiful. I bet the people that made the furniture wish they had done that. People laugh at me and say that if it stood still I would paint it. Just love it and all your projects. Hi Lindsey. The walls are painted with Sherwin Williams Accessible Beige. Beautiful room! I love the painted furniture. I’ve been struggling with how to refinish 4 diningroom chairs that are extra chairs, we only use them when we have more than 6 guest at the table and I think gosh these chairs need help. Now I will paint them & recover them. Thank you for this fantastic idea! Amazing change in the dining room! I also enjoy what you did on the front porch for Christmas! 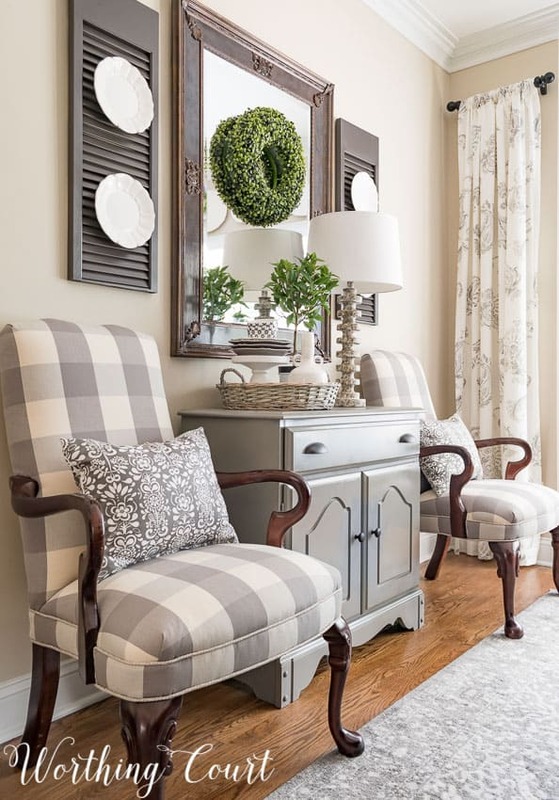 I am in love with the buffalo check chairs against the wall! Can you use them at your dinning table? Do you know where I might be able to find some similar ones? Do you mind sharing the name and brand of this wall color. Looking, but not seeing it. Thanks! Hi! Love the shutters with plates on them! Just curious- what did you use to hang the plates with? Would love to do this at my house! Suzy, thank you so much for sharing this beautiful design. I love your style. Everything you do inspires me to try some small projects in my home. Love how you have transformed your dining room, especially the dining room table and chairs. I have a similar table and would love to try painting it as well. Any tips you can share? Hi Lori. You can read more about painting my dining room furniture in this blog post: https://www.worthingcourtblog.com/dining-room-finishing-touches/ . But if that doesn’t answer any questions you may have, just shoot me an email! I love the look of the rug. I cannot tell if it is a dark grey or more of a lighter silver. Can you advise? Rom is stunned get. Hi BJ. I would classify the rug in my dining room as more of a medium gray with the pattern being a white’ish silvery color. 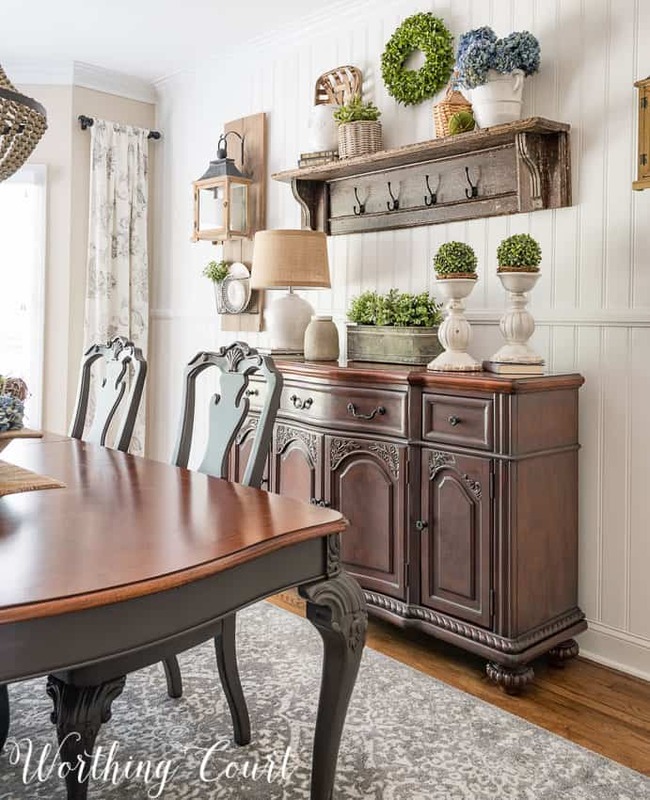 Love what you have done, I have one question – where did you get the Buffalo Check fabric used in the dining room? Hi Roxann. I found the fabric at a local fabric store called Printer’s Alley. I am so sorry I’m late with this THANK YOU! 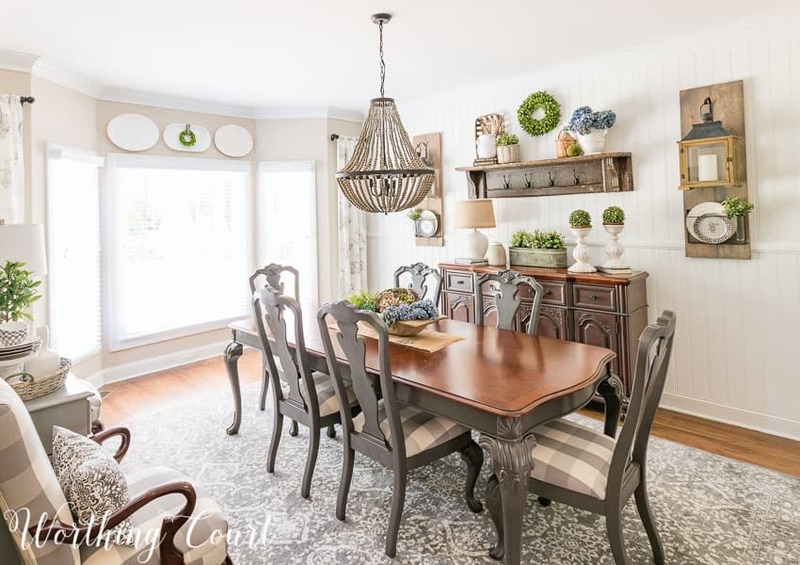 You have been such an inspiration, and help, to me with painting my beach house dining room….I am so in love with how my table and chairs turned out, and since my floors are a palm leafed patterned beige carpet, I put a light grey on the walls. Next project is to find the perfect things for the walls!! Thank you for always sharing your talent with some of us frustrated decorators!!! Wow! I’m in love with this room. My favorite is the hanging lanterns with the baskets underneath them. Please tell me where I can find a pair like yours. Thanks for sharing your home with all of us. Love the Buffalo plaid chairs and coordinated lumbar pillows! What sheen of spray paint did you use? It looks like there are several to choose from – gloss, enamel, etc. I’m anxious to try out the spray paint idea. I’m also going with accessible beige on my walls and using gray tones. Hi Cheryl. All of the paint that I used is a satin/eggshell finish. I think you’ll love using Accessible Beige along with gray. Happy painting! Would you be able to let me know the name of the curtains you have I love them!! I also love the whole room but those curtains are perfect! Hi Suzy! I know this post is from awhile ago, but I have been searching EVERYWHERE for those curtains you have in your picture. Where did you purchase them at? Those draperies came from HomeGoods, but I’ve also seen them at TJ Maxx and Marshalls. 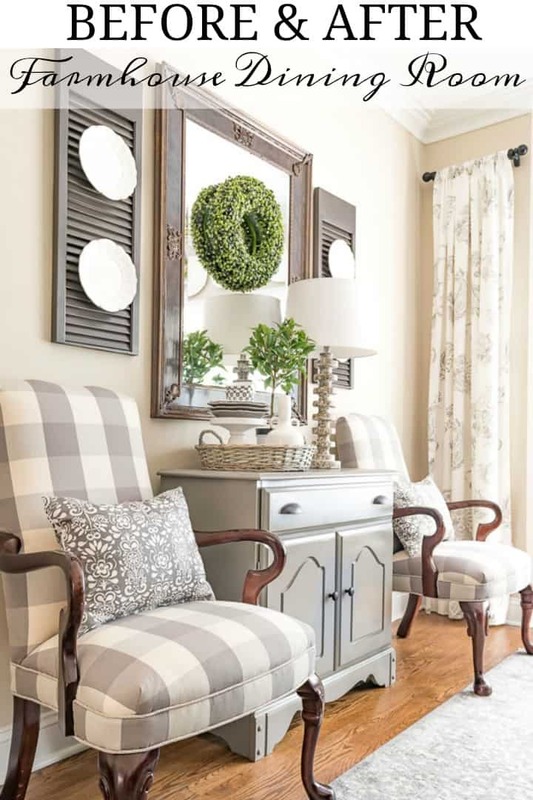 I desperately would love to know where the plaid fabric is from that covers your accent and dining room chairs! Thank you! Hi Kayli. The fabric that you’re asking about came from a local fabric store a couple of years ago. I’m sorry, but I wasn’t able to find out the mill or style number so that it could be ordered elsewhere. Thanks so much for your detailed explanation of everything you do! It’s so helpful! We’re painting an old coffee table to go into our living room which is gray, white and tan. I’m wondering if you used the same color for the small chest as the chairs? Also, our living room has beautiful oak trim and large oak fireplace mantel and side shelves built in. It’s a lot of oak which seems to fight with the grays and whites. The thought of painting it sounds crazy! Any suggestions? The paneled walls you put up in the dining room behind the buffet appear lighter than the other walls. Is it a different color? If it is, would you please share that color with me. I LOVE what you did in the dining room. Beautiful~ Thank you. Looks great! Any tips on where to find the white plates for the wall collage? I have been searching? Thank you! Hi Brandi. I found all of the plates that I used on the wall at TJ Maxx! Hi there! Love your style! How did you get the plates to hang on the door you cut in half! Love it so much! Good morning! Each plate has a plate hanger (the kind with springs and hooks) attached to the back of it. To attach them to the shutters/door halves, I ran a piece of green florists wire through the plate holder, threaded it through the slats and then twisted the wire together on the back side. Hope this makes sense! Your dining room is gorgeous and I am stunned at the transformation of the table and chairs after you painted them gray. Just so amazing!